Nat's note: I have to guiltily admit that Tom sent me this over a month ago and I've not gotten around to posting it. I can only apologise to both he and you... Enjoy! Although I love Christmastime, through all the turkey, chocolate and comatose family members I couldn't help eyeing the RBA and Birdguides updates thinking “I only have a few days left off work...” so at the first opportunity I set out, at 5am on the 28th December. My initial targets were the Dusky Warbler and Glossy Ibis that had been at Ham Wall RSPB in Somerset all week. In the back of my mind I knew there had been a Cattle Egret at Steart Marshes WWT nearby too. All three species would be lifers for me. Now I've always considered myself a birder first and not just another twitcher, but with a full time job and me and Nat's shared target of 400 species by age 40 I have to admit I now plan my birding days around specific species and I'm happy to travel a few hundred miles in one day to get them. These trips have had mixed results, including a 400 mile round trip to see exactly zero Long-billed Dowichers, but I usually come home with at least one new species. So on this surprisingly mild late-December morning I set off, with a belly full of toast, a tank full of diesel and a head full of potentially misplaced optimism. I arrived into the car park at Ham Wall RSPB at around 7:30am, just after sunrise. I was a little surprised to see around five cars already parked up. I checked my phone and the most recent update online was that the Dusky Warbler was still present at 7:20am! I grabbed my kit out of the boot and headed into the reserve. I passed a fellow birder who was walking out of the reserve and asked if there was anything about (ALWAYS ask every birder you pass – there's nothing like knowledge on the ground when it comes to locating birds), he confirmed that the Dusky was “showing well” and pointed me in the right direction. My heart skipping I headed deeper into the reserve and found a flock of around 10-15 birders all looking into a bank of trees and scrub on the other side of a narrow canal. Apparently the bird had been showing well but had flown into the scrub and hadn't even called for the past ten minutes. My heart sank...was this another Long-billed Dowicher? I remembered that a Glossy Ibis had been around too and asked about that. I was told it was only 50 metres or so further along the canal, in a small lagoon feeding on one of the reed-covered islands. As I felt the Dusky was going to be skulking unseen for some time I headed towards the lagoon and joined a birding couple who were already looking over the pool. 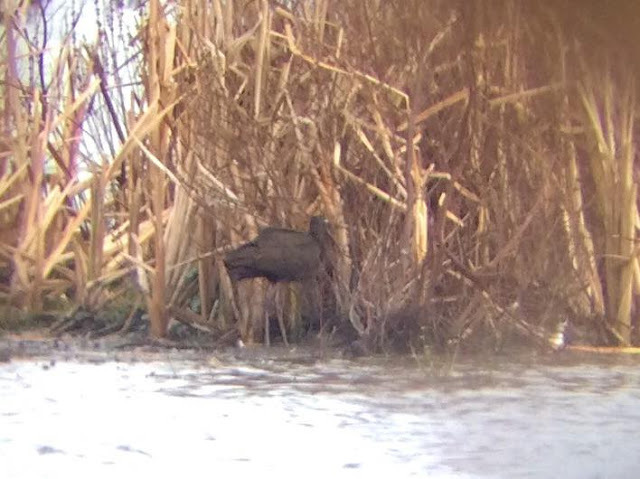 I asked if they'd seen anything and they said they were “just watching the Glossy Ibis.” Bingo! I set up my scope and there it was, lazily mooching through the mud at the edge of the reeds next to some Lapwings. I took a few freehand photos on my phone through my scope (I don't possess the photographic skill of Natalie I'm afraid) and then headed back to the clump of Dusky-hunters. Whilst waiting and casually scanning the relevant scrub I was approached by a familiar face – it was a birder from Stafford who Nat and I had met at the Rough-legged Buzzards in Choseley on our Norfork trip! No matter how far you travel when birding it really is a small world. Mid-way through mutually moaning about the dipped Red-rumped Swallow someone piped up “It's calling!” Everyone froze and listened to the Dusky Warbler, its call sounds like a Wren but much quieter and much more intermittent. The now 20-or-so of us followed the sound through the scrub before it suddenly jumped onto an exposed bit of fern before almost immediately flitting onto a tree trunk covered in ivy. I managed to get it in my bins as it climbed up the ivy, I could see a typical Phylloscopus warbler but very brown, I couldn't make out the pale supercillium at this angle though. It reached the top of the ivy and flew left onto a bare branch, its head was obscured so I still couldn't get the supercillium, but I could see its uniform warm brown upperparts and it's pale grey underparts very nicely. The ID was greatly helped by the fact it was happily calling away the whole time it was visible. It then shot left behind another tree and vanished. Amazing! Two lifers and I'd only been here about 45 minutes. I waited another 30 minutes to see if the Dusky would reappear during which time birders who had been saying “was that it? I only saw it for 5 seconds” were now saying “What a great bird, I'm so glad it showed so well!” From what I'd gathered from the local birders, 5-10 second bursts between 2-3 hour waits had been typical for this bird. 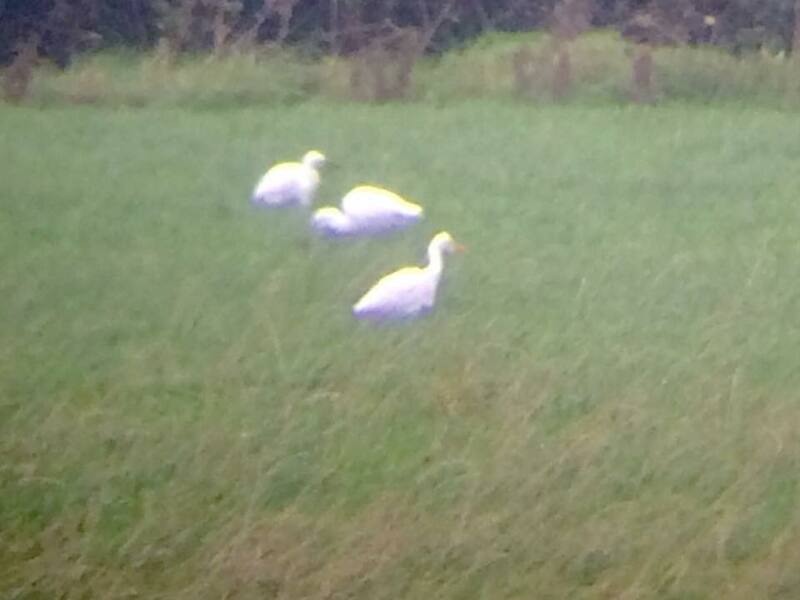 I figured as it was only about 9.30am now I should definitely try for the Cattle Egret at Steart Marshes WWT. I jumped in the car and got over to the bank of the Severn Estuary in about 40 minutes. My previous experience of Steart Marshes was that it was a brand new reserve still being developed but covered by a network of boardwalks and landscaped paths. Based on this I kept my trainers on and walked towards the one part of the reserve I hadn't yet been to. The one part of the reserve that had not yet been covered in a boardwalk or landscaped path... One sodden gangrenous kilometre later I found four Welsh birders also looking for the Cattle Egret. We teamed up and headed deeper (in more ways than one) into the marsh. We spotted a group of Egrets in a field at the far end of the marsh. We set up scopes and within a few seconds one of the Welsh contingent picked out the Cattle Egret, we all got it in our scopes and I took a few more wobbly shots through mine. This was the best day's solo birding I'd had, potentially ever! I checked the time and it was just after twelve. Three lifers in one morning! The birding gods were clearly shining on me so...it's almost like I was being told to keep going, right? I checked the reports on my wade back to the car to see what was within an hour's drive and saw there was Ferruginous Duck down in Hampshire, lots of Great White Egrets and an American Wigeon down in Exmouth. I've seen a Fudge Duck and Great White Egrets before but American Wigeon would be new, plus I'd seen that it had been seen there for around a month. That's it, after the walk back to the car I should get down there by 2pm, enough time to find it before the light fades. So by 1pm I was back on the M5 for its final 50 miles to Exeter. 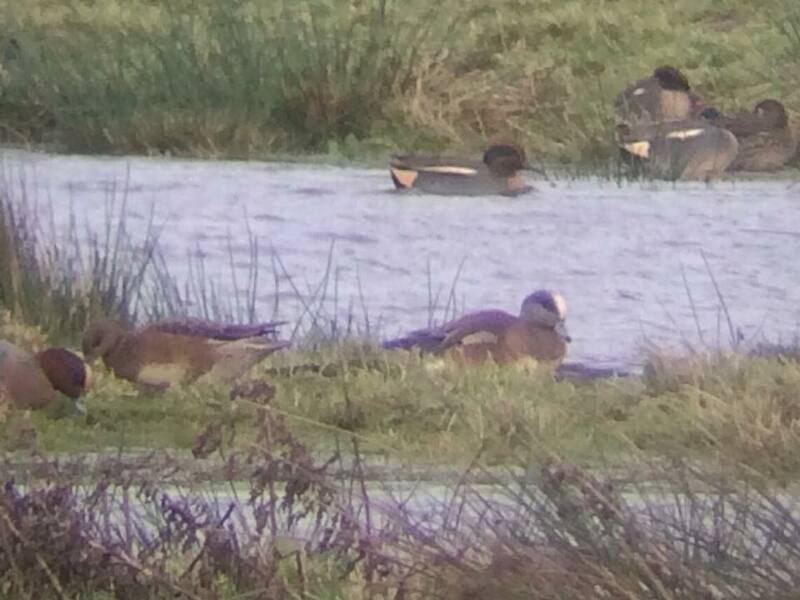 The American Wigeon had been at Exminster Marshes RSPB for the past three weeks but apparently it had moved to Bowling Green Marsh RSPB that morning. I'd not been to either reserve before so I didn't know what to expect or how difficult it would be to locate a single bird. My sat-nav took me to a very narrow road round the back of a residential street. There was a surprising number of walkers on the road, and I got the impression cars weren't really meant to be going down there so I found a soft verge out of the way and parked up. The RSPB reserve consists of one hide overlooking a wide, waterlogged field. On the walk back to the hide from the car I found a flock of Brent Geese and had a look through just in case there were any interesting subspecies, none there but I've always liked Brent Geese. There were a couple more gaps in the hedge on the walk to the hide through which I could see groups of Wigeon. I picked through them but couldn't find any star-spangled or gun-toting ones so moved on. I reached the hide which had a full glass front and a small education room (closed as there were no volunteers at this time of year) and set up my scope. There were two families in there and two more experienced looking birders. I asked the nearest birder if he'd seen the American Wigeon and he said “I've been looking for it all afternoon and I just found it as you walked in, do you wanna look?” What is happening today?! Four fairly easy lifers and not a single dip; I wish I could bottle this! After half an hour of enjoying the Wigeon and taking a few more freehand shots on my phone I packed up and headed back to the M5. Days like this make it all worthwhile, and takes me to 242 species, so just 35 more days like this and I've got the magic 400.